Le Val de Bonnal - Jura & French Alps, France - Book online now! Situated beside a picturesque river, Le Val de Bonnal is a prominent luxury camping location that is ideal for nature lovers. This serene setting has been created to inspire relaxation, although that doesn’t mean that spending time at Le Val de Bonnal is dull. In fact, there are plenty of adventurous activities that can be enjoyed here, while laundry and washing facilities make this also a very convenient place for a camping holiday. What Makes Le Val de Bonnal So Special? This LUX-camp location has everything a water lover could ever dream of. One of the most prominent features of the area is the large lake and a range of different types of water sports are available here such as kayaking and canoeing, while guests who are just after a bit of splashing around and paddling will find an impressive water park that comes complete with slides, pools and a bridge spanning the water. Looking to get back to nature? There is plenty to do here, with almost endless options in the surrounding environment. A series of picturesque hiking trails run around the large and into the surrounding pine forests and are just waiting to be explored, while people who have a head for heights and a strong sense of adventure can glide high over the river on a zipline. 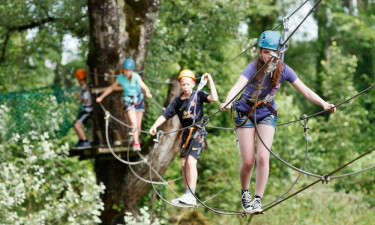 The staff at this luxury camping site understand that adults sometimes need a break from the children, so they organise special entertainment just for the kids. Separate clubs are arranged for young children and teenagers to make sure that kids of all ages will be able to take part in their favourite types of activities and enjoy a tailor made entertainment programme. 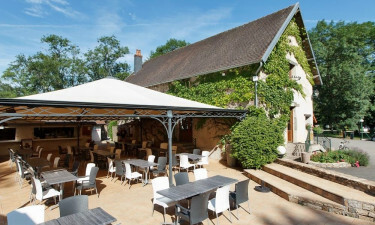 Guests who’d rather take a much needed break from cooking will be able to indulge in popular French dishes at Le Val de Bonnal’s popular restaurant. Dressing for diner and securing a spot at one of the tables in this stylish and scenic setting helps to complete the luxury camping experience, while a cosy bar is also attached to the restaurant and this is a good place to sip a few glasses of France’s famous wine. 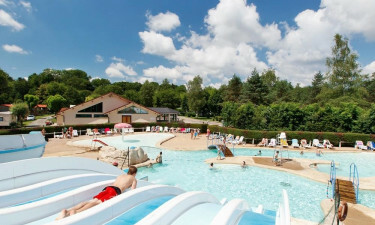 People who book a modern mobile home at Le Val de Bonnal will find that it is fully loaded with everything that the whole family needs to be comfortable. One of the great things about this type of accommodation is that it can be used to create a home away from home and it even comes complete with cooking facilities. This allows guests to shop for groceries at the onsite supermarket and create delicious and nutritious meals that the family will love if they wish.